Mensusa https://www.mensusa.com/articles/brown-suit-perfect-for-weddings.html Brown Suit- Perfect for Weddings A brown suit adds color and style to your formal wear perfect for a wedding. Macy's offers a wide selection of brown suits and 3 piece brown suits. Wedding season is upon us. It is the perfect time of year to begin shopping for your formal attire, whether you are renting or purchasing. If you are looking for a brown suit to boast your unique style, Macy's offers a wide selection of brown suit for you to choose from. There are also multiple brands you can choose from as well, including tommy hilfiger and ralph lauren. These suits come in different shades of brown, from very light to very dark, so that you can choose which shade best matches your skin tone and other accessories you might pair with your suit. 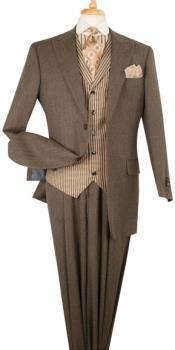 Different styles of brown suits are also available, including traditional 2 piece brown suits and 3 piece brown suits. You can either purchase a 2 piece brown suit or a 3 piece brown suit, depending on your style preference. There are advantages to choosing a 3 piece brown suit, such as being able to wear only the vest and trousers if it gets too warm, but it is optional. When it comes to extremely formal occasions like weddings, a men's brown suit is one way to show off your unique style while staying comfortable and confident throughout the occasion. Wearing a brown suit instead of a more traditional tuxedo will turn heads in a good way, because it is unexpected, but it is not inappropriate to dress this way for a formal obligation. Wearing a brown suit, though slightly less formal than a traditional black and white tuxedo suit, adds a little bit of color to the occasion instead of sticking to more traditional colors. It can make you stand out from the other guests and members of the wedding party as well. A men's brown suit will add an extra splash of color to the scene and allows you to experiment with different colored vests and ties that will go along with the rest of your attire and the accessories you pair with your formal wear. Wearing a 3 piece brown suit to your next wedding will give you a heightened look of sophistication both in front of the photographer and on the dance floor. Unlike the less formal 2 piece suit, a 3 piece suit includes not only trousers and a suit jacket, but a matching vest which your tie tucks under. Dressed this way, very little of your dress shirt shows beneath the vest, jacket and tie, which gives off a more solid look. The vest portion of the suit, the unique element of this particular style of men's formal wear, stays buttoned so that the dress shirt you wear underneath the vest and jacket does not show as much as it does when you wear a two-button suit jacket without a vest. Because the fabric and color of all three pieces of the suit, the trousers, the vest and the jacket are the same, wearing this kind of suit brings a new level of elegance to your formal look. The most notable advantage of choosing the 3 piece brown suit is that you do not have to wear both the jacket and the vest at all times. You can wear the trousers and vest without the jacket and still look appropriately dressed for the occasion. Wearing the vest is not only an acceptable form of attire paired with your dress shirt alone, but having that option, instead of having to wear the jacket at all times throughout the ceremony and after, can also give you a sense of comfort and reassurance as you focus on other details of the event. You may want to consider making your suit a permanent addition to your wardrobe to incorporate a little timeless class into your formal style. A three piece suit can be used for other occasions after you purchase it for your formal event, such as formal dinners or business meetings The advantage is that you can leave the best out of the ensemble depending on the occasion and whether or not you are going for a more unique style or simply need formal attire that blends in..
Opting for a brown suit for your next wedding will give you the elegance and comfort you will need to both blend in and stand out. Purchasing a three piece suit will give you multiple style options and might even allow you the opportunity to wear the suit for other occasions as well..